According to the BIC facebook, they’re giving away 130 free Atlantis Pens every hour, from 10am – 8pm ET everyday in August. Just click here and “Like” their Facebook page and check “The Cork Board” tab on the hour to try and request yours. I love these pens. Might keep trying all day to get one. Love to get stuff for free. 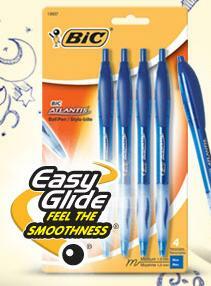 I love BIC Atlantis Pens. just tried for the free pens, page kept reezing, and at 2 minutes after 12, pens were gone…. Very frustrating. Clicking on the hour to find out all the pens are gone. Would love to try this new pen. Never used one before!! These pens help make my handwriting neat and legible. Can always use soem pens!!! Love to win this amazing pen. BIC PENS ARE THE BEST!!!!!!!!! Being a teacher, I can always use another pen! Love it! I clicked exactly on the hour and messages said “PENS HAVE BEEN DEPLETED. How can that be? I need it for work. these go in less than a second on the hour? Finally I got through. Tried so many times. Doesn’t work. Was here right at change of the hour and when I click on the link, I get this message. I use a lot of ink pens because I love to write. BIC is the best! Is this still going on in September?